These are the chords to the songs on "the brother who lived" (2003). 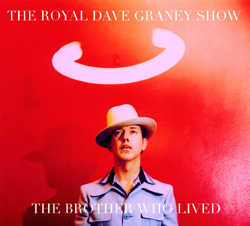 Six songs were recorded with the RDGS, two with myself, Clare and Greg Walker, one by the two of us and one all by my own self. "I'm seein' demons" is in Emajor7 (with a minor )and then also a Minor 9th. Then to a D/Gmaj7 Amajor7 with a minor, Gmaj7 and Cmajor 7. Its creepy and queasy. Two acoustic guitars , shaker , drums and lead vocal all put down live and then the bass and keyboard added later. I guess its about the Australian scene with the population all artfully divided and ruled by the conservative gangsters in power. Everybody sees demons. The country singer Chad Morgan also once told a story about having the DT's and looking into the audience at a club and they all had pigs heads with trotters! "the brother who lived" started out with a rhythm pattern from our old latin box. We built the rhythm up with Greg Walker. I put down the guitar and the bass and then Stuart and Bill and Clare sang. Its built around an A to a D and then a C and then an E. None of them are major and most have 9th notes added. Its quite open and simple sounding but the chords are weird. The subject matter is a musician. Like Syd Barrett or Nick Drake. Only there's two of 'em and one lives and one dies. And the one who dies lives and the one who lives dies. "Midnight to dawn" is in Gmaj7 to C maj7 to F ( with a b note, sliding down from F#) . The chorus is all in A to Asus. It's all about a time. "There's the royal troll" has a kind of latin rock beat. It starts on Bdiminished and then goes to A (with a flattened 5th) and then D and E. Again all the chords are open and weird. ( I don't know what they are called.) Clare sings the backing vocal by herself. We were going for bell-like sounds rather than folksy harmonies. I picked up a Harp and blew the solo later. We put it through some crappy amp sound to get that blue electric wail. It's a song about a friend who lives the straight life but a few of us know his true face. 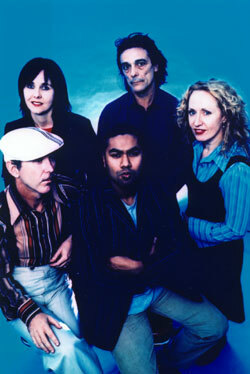 DG,Adele Pickvance, Stuart Perera, Bill Miller, Clare Moore. "All our friends were stars" is one of two songs recorded with Greg Walker at the beginning of the project. We cooked up the rhythm from an old machine , recording each sound separately. I played the guitar and the bass and Clare played the keys. It goes from a Bsus to Emin9 to Amsus to Dm7/9 to Gmsus to Cm7/9 to F and then to F/F#sus. It descends in a very Euro style and sounds very discomocious with the latin beat. Greg worked on the strings and then we laid on the b/vs. With a trowel. I love it. Lyrically its a song about all the celebrities in the gang of urchins I ran with when I was about 13. Smokin' fags and eatin' tons of gum and runnin' around at the horse races and the pool hall. "She looked at me from out of her eyes" was recorded completely by moi. Acoustic and electric guitars , vocals and bass. The chords are all unresolved jagged things like the D with E/Fand C all sounding at once. The chorus is in A. The middle 8 goes from A# to Dmaj7 and then Gm with a flattened 5th to a G. The title came from a Raymond Chandler book. Some woman peeking out from behind her curtain of hair and beyond that, her eyes. It's spooky and unsettling. "Like a millionaire" is a disco track that Clare and I cooked up. The chords go from A#maj7 to Amaj7 to E7sus and then from F7 to G to F7sus. We wanted the backing vocals to be like that sound of massed voices in those modernist musicals. Like Phillip Glass or Max Roach's "Its time!". The lyric is about an artist so on top of his game he surveys the scene from on high. From the future (at the end , looking back) and also in the middle of the story. "A boy named Epic" uses a lot of maj7 chords that are also suspended. Basically E to Ato G to A. The chorus is D7sus to Dmaj7sus to D9sus to Dmaj7sus. And then further variations on D that you can figure out if you want. Lyrically its a song that revolves around an old friend called Epic Soundtracks who was a musician in the UK and beyond. He practically invented lo fi indie rock with the Swell Maps and played in Crime and the City Solution and These Immortal Souls. An amazing collector and enthusiast of music. I don't think he would've really liked it as its a bit too R&B for his tastes. "I am your humble servant" is the oldest tune. It almost made it to "Heroic Blues' but was a bit too spiky. It was recorded with myself in a booth, singing and playing all at once with Bill in another booth and Adele and Clare in another. It goes from Emin9 to A and then Dm7 to G . The chorus is A9 to A9 with a flattened 5th to A.
Lyrically its an imaginary pitch for political office. Its a cry for old fashioned politicians who were out to get some cash and you could see where it all went when you saw their corpulent, diseased persons on display. As opposed to the grey automatons who front for mono national companies today. "Twilight of a villain" is all Clare and me. She's on keys and I'm on bass and guitars. Its all open chords on the guitar. A D chord that includes A/B/C/D/E to an A that has A/B/C/D and E in it. The chorus is kinda Spingsteenesque. C7/9 to A#7/9 to F to G#7/9. Lyrically its about an old crim/musician/scrote out on the street too late. Hashish? back to the beginning of Davids' songwriting story?